We created this printable Map of Japan for you to label and color. You could try these variations on mapping techniques: Make a population map, a resource map showing where natural resources are located, use latitude and longitude coordinates to help kids find each of the cities above, give each of the four main islands its own color, surround your map with images of places in Japan with a line pointing out the location of each one, or make a relief map from salt dough. 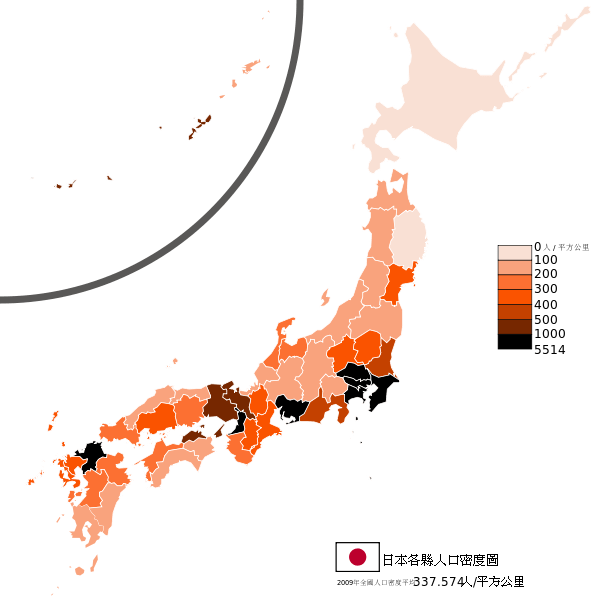 This is a thematic map that shows the population density in Japan. Image CC license, Wikimedia. Learn about Japanese animals starting with the Macaque Monkey. Japan is a series of volcanic islands and often has eruptions, earthquakes and tsunami’s. Make a model volcano. Look for Japan in current events in the newspaper, on TV, or in internet news. Keep a scra book of news relating to Japan. Japan experienced a major Tsunami in March of 2011. Starting in the spring of 2012 debris that had been washed out to sea from Japan started arriving in Alaska, British Columbia, Washington, and Oregon. Learn about ocean currents, how they carry water, stuff, and weather around the world. Learn about tsunamis and why they cause so much damage. Go on a scavenger hunt around your house looking for items made in Japan. Which major brands are Japanese made? How does world wide trade benefit you?